Any show which opens with ‘Return of the Grievous Angel’ and ends nearly two and a half hours later with ‘Sin City’ always has the potential to be a special evening. When you throw into the mix the hosts being two highly respected artists in the wider country music world who have just produced a stellar duet album, then the fulfilling of that potential is never in doubt. 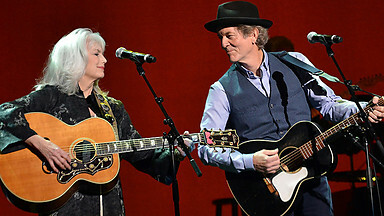 They may have first been acquainted almost forty years ago but the current collaboration between Emmylou Harris and Rodney Crowell has had the critics drooling despite both performers being significantly past their sixtieth year. The album OLD YELLOW MOON is set to receive enormous accolades at this year’s AMAs and in an ideal world also the CMAs but we’ll leave that debate for another day. Audiences in the UK have supported both performers for a very long time and those fortunate to be present tonight witnessed a comprehensive and very enjoyable evening. Those who like their concerts structured were in luck at Birmingham’s towering Symphony Hall as Emmylou and Rodney, supported by a five piece band, neatly packaged the set into a series of themed parts. First up a constant stream of unannounced classics, then two stools were brought on to make the acoustic section more intimate, an airing of OLD YELLOW MOON, before some more oldie favourites to send everybody home happy. Emmylou’s brief but influential liaison with Gram Parsons helped spawn a whole genre and through the bookended songs, ‘Wheels’, ‘The Angels Rejoiced Last night’, and the heavenly ‘Love Hurts’, memories swirled around the auditorium throughout the evening. With his career forming Texas upbringing and distinct vocal style, Crowell’s output over the years has cemented his eminent standing, first in the mainstream country music field and then, when that moved in alternative directions, the evolving Americana movement that filled the void. Through songs like ‘Earthbound’, ‘The Rock of My Soul’ and, as part of a rocking finale, ‘I Ain’t Living Long Like This’, we were all reminded of what a fine performer he is in his own right. Emmylou, described by Rodney as having ‘the soul of a poet, the voice of an angel and the heart of a cowgirl’ has probably made her name as much as an interpreter of other songs as well as a writer herself. During the set she celebrated Townes Van Zandt (‘Pancho and Lefty’) and remembered two recently departed, close and highly revered friends – Kate McGarrigle (‘Darlin' Kate’) and Susannah Clarke (I’ll Be Your San Antonio Rose’). As celebrated as Emmylou and Rodney are, they had some excellent support from a fine band and a hard working guitar techie. Leading the band from the front was an exceptional guitarist from Australia named Jedd Hughes who topped his exquisite performance throughout with a breathtaking solo piece on 'Luxury Liner’ . Long term Emmylou associate Steve Fishell added the continual Pedal Steel and Dobra sound in an accomplished and essential manner warranted by a triple A rated country music concert. The sheer quality of the older material shared during the evening was immense but even that had to take second best when Emmylou and Rodney got around to showcasing nine songs from OLD YELLOW MOON. These fabulous tunes headed by Emmylou at her country best on ‘Hanging Up My Heart’ were the show’s highlights as we were treated to the sultry blues feel to ‘Black Caffeine’. In this segment of the set there were also stunning versions of Matraca Berg’s ‘Back When We Were Beautiful’, Patty Scialfa’s (aka Mrs Springsteen) scintillating ‘Spanish Dancer’ and the country waltz sentimentality of title track ‘Old Yellow Moon’, although this came a little later to close the main set. Rarely has such a lengthy-no interval gig gone by so quickly and this is to the credit of all seven performers adorning the Symphony Hall stage. 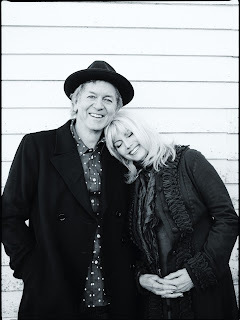 The first standing ovation preceded the encore launching-Crowell led ‘Stars on the Water’ which was suitably followed by Emmylou enthralling everybody with a closing of the Gram Parsons circle. Time has been very kind to these two performers but it is also wise to treasure these events as the inevitably of life will ultimately dictate progress. It may have taken them forty years to finally formalise their recording collaboration but on the evidence of this evening’s show, there is definitely a lifetime of synergy.